Apixaban, sold under the tradename Eliquis, is an anticoagulant for the treatment of venous thromboembolic events. It is taken by mouth. It is a direct factor Xa inhibitor. Apixaban was approved in Europe in 2012. It was approved in the U.S. in 2014 for treatment and secondary prophylaxis of deep vein thrombosis (DVT) and pulmonary embolism (PE). It is being developed in a joint venture by Pfizer and Bristol-Myers Squibb. To lower the risk of stroke and embolism in patients with nonvalvular atrial fibrillation. Deep vein thrombosis (DVT) prophylaxis. DVT's may lead to pulmonary embolism (PE) in knee or hip replacement surgery patients. Treatment of both DVT and PE. To reduce the risk of recurring DVT and PE after initial therapy. Apixaban is recommended by the National Institute for Health and Clinical Excellence for the prevention of stroke and systemic embolism in people with non-valvular atrial fibrillation and at least one of the following risk factors: prior stroke or transient ischemic attack, age 75 years or older, diabetes mellitus, or symptomatic heart failure. Apixaban and other newer anticoagulants (dabigatran and rivaroxaban) appear equally effective as warfarin in preventing non-hemorrhagic stroke in people with atrial fibrillation and are associated with lower risk of intracranial bleeding. Premature discontinuation of any oral anticoagulant, including apixaban, increases thrombotic event risk. This is not due to any rebound effect from discontinuation. To reduce this risk, administering another anticoagulant is advised. Apixaban can increase the risk of bleeding and may cause serious, potentially fatal, bleeding. Concurrent use with drugs affecting hemostasis (e.g. other anticoagulants, heparin, aspirin and other antiplatelet drugs, selective serotonin reuptake inhibitors, serotonin norepinephrine reuptake inhibitors, and nonsteroidal anti-inflammatory drugs (NSAIDs) can further increase the risk of bleeding. One concern with the use of apixaban and the other newer anticoagulants is the absence of well-established protocol for reversal of their activity (no antidote is available). This is an important disadvantage relative to warfarin when bleeding complications occur or when people taking the drugs require emergency surgery. When spinal/epidural anesthesia or puncture is utilized, patients who are being treated with anti-thrombotic agents for the prevention of thromboembolic complications are at risk for developing a hematoma, which can cause long-term or permanent paralysis. The risk of this may be increased by using epidural or intrathecal catheters after a surgical operation or from the concurrent use of medicinal agents that affect hemostasis. 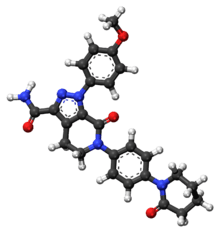 Apixaban is a highly selective, orally bioavailable, and reversible direct inhibitor of free and clot-bound factor Xa. Factor Xa catalyzes the conversion of prothrombin to thrombin, the final enzyme in the coagulation cascade that is responsible for fibrin clot formation. Apixaban has no direct effect on platelet aggregation, but by inhibiting factor Xa, it indirectly decreases clot formation induced by thrombin. A new drug application (NDA) for the approval of apixaban was submitted to the FDA by Bristol-Myers Squibb and Pfizer jointly after conclusion of the ARISTOTLE clinical trial in 2011. Apixaban was approved for the prevention of stroke in people with atrial fibrillation on December 28, 2012. On March 14, 2014, it was approved for the additional use of preventing deep vein thrombosis and pulmonary embolism in people that had recently undergone knee or hip replacement. On August 21, 2014, the FDA approved apixaban for the treatment of recurring deep vein thrombosis and pulmonary embolism. During development it was known as BMS-562247-01. ↑ "ELIQUIS® (apixaban) Approved In Europe For Preventing Venous Thromboembolism After Elective Hip Or Knee Replacement" (Press release). Pfizer. April 20, 2012. Retrieved 2012-05-29. 1 2 "U.S. FDA Approves Eliquis (apixaban) for the Treatment of Deep Vein Thrombosis (DVT) and Pulmonary Embolism (PE), and for the Reduction in the Risk of Recurrent DVT and PE Following Initial Therapy" (Press release). Pfizer. August 21, 2014. Retrieved 2016-02-26. ↑ "Bristol-Myers Squibb News Release 26 April 2007". Archived from the original on 11 September 2007. Retrieved 2007-09-15. ↑ Nainggolan, Lisa. "Apixaban better than European enoxaparin regimen for preventing VTE". Retrieved 2011-04-01. 1 2 3 4 "Eliquis (apixaban) [prescribing information]" (PDF). Princeton, NJ: Bristol-Myers Squibb. March 2014. Retrieved 2014-10-29. ↑ "Apixaban for preventing stroke and systemic embolism in people with nonvalvular atrial fibrillation" (PDF). National Institute for Health and Care Excellence. January 2013. Retrieved 2016-02-26. ↑ Gómez-Outes, A; Terleira-Fernández, AI; Calvo-Rojas, G; Suárez-Gea, ML; Vargas-Castrillón, E (2013). "Dabigatran, Rivaroxaban, or Apixaban versus Warfarin in Patients with Nonvalvular Atrial Fibrillation: A Systematic Review and Meta-Analysis of Subgroups.". Thrombosis. 2013: 640723. doi:10.1155/2013/640723. PMC 3885278 . PMID 24455237. ↑ "ELIQUIS® (apixaban) tablets Factor Xa Inhibitor" (PDF). FDA. August 2014. Retrieved 2014-11-02. ↑ Enriquez A, Lip GY, Baranchuk A (2015). "Anticoagulation reversal in the era of the non-vitamin K oral anticoagulants". Europace. doi:10.1093/europace/euv030. PMID 25816811. ↑ Frost C, Wang J, Nepal S, et al. (February 2013). "Apixaban, an oral, direct factor Xa inhibitor: single dose safety, pharmacokinetics, pharmacodynamics and food effect in healthy subjects". Br J Clin Pharmacol. 75 (2): 476–87. doi:10.1111/j.1365-2125.2012.04369.x. PMID 22759198. ↑ Granger, M.D. et. al., Christopher (September 15, 2011). "Apixaban versus Warfarin in Patients with Atrial Fibrillation". New England Journal of Medicine. 365 (365): 981–992. doi:10.1056/NEJMoa1107039. PMID 21870978. Retrieved 17 September 2015. ↑ Neale, Todd (March 14, 2014). "FDA OKs Apixaban for DVT Prevention". MedPage Today. Retrieved 17 September 2015.